In 'A Noiseless Patient Spider', Broadway: A London Magazine (1868), reprinted in Leaves of Grass (5th ed., 1871, 1888), 343. I believe with Schopenhauer that one of the strongest motives that lead men to art and science is escape from everyday life with its painful crudity and hopeless dreariness, from the fetters of one’s own ever shifting desires. A finely tempered nature longs to escape from personal life into the world of objective perception and thought; this desire may be compared with the townsman’s irresistible longing to escape from his noisy, cramped surroundings into the silence of high mountains, where the eye ranges freely through the still, pure air and fondly traces out the restful contours apparently built for eternity. Address at The Physical Society, Berlin (1918) for Max Planck’s 60th birthday, 'Principles of Research', collected in Essays in Science (1934) 2. It is probable that serum acts on bacteria by changing the relations of molecular attraction between the bacteria and the surrounding fluid. In Studies in Immunity (1909), 144. Science has “explained” nothing; the more we know the more fantastic the world becomes and the profounder the surrounding darkness. Along the Road: Notes and Essays of a Tourist (1928), 108. 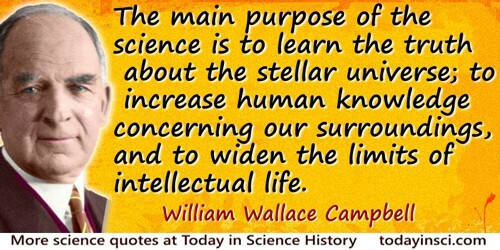 Science is but a feeble means for motivating life. It enlightens men, but fails to arouse them to deeds of self-sacrifice and devotion. … It dispels ignorance, but it never launched a crusade. It gives aid in the struggle with the hard surroundings of life, but it does not inform us to what end we struggle, or whether the struggle is worth while. … Intelligence can do little more than direct. As quoted by M.G. Mellon in his retiring Presidential Address to the Winter Meeting of the Indiana Academy of Science at the University of Notre Dame (30 Oct 1942), 'Science, Scientists, and Society', printed in Proceedings of the Indiana Academy of Science (1943), 52, 15. No source citation given. So far from science being irreligious, as many think, it is the neglect of science that is irreligious—it is the refusal to study the surrounding creation that is irreligious. 'What Knowledge is of Most Worth'. Lectures in Education delivered at the Royal Institution (1855). In The Westminster Review (Jul 1859), 22. Collected in Essays on Education and Kindred Subjects (1911), 41. The earliest signs of living things, announcing as they do a high complexity of organization, entirely exclude the hypothesis of a transmutation from lower to higher grades of being. The first fiat of Creation which went forth, doubtlessly ensured the perfect adaptation of animals to the surrounding media; and thus, whilst the geologist recognizes a beginning, he can see in the innumerable facts of the eye of the earliest crustacean, the same evidences of Omniscience as in the completion of the vertebrate form. The growing complexity of civilized life demands with each age broader and more exact knowledge as to the material surroundings and greater precision in our recognition of the invisible forces or tendencies about us. [Before the time of Benjamin Peirce it never occurred to anyone that mathematical research] was one of the things for which a mathematical department existed. Today it is a commonplace in all the leading universities. Peirce stood alone—a mountain peak whose absolute height might be hard to measure, but which towered above all the surrounding country. In 'The Story of Mathematics at Harvard', Harvard Alumni Bulletin (3 Jan 1924), 26, 376. Cited by R. C. Archibald in 'Benjamin Peirce: V. Biographical Sketch', The American Mathematical Monthly (Jan 1925), 32, No. 1, 10.